The entry-level Mercedes-Benz C-Class has long felt like nothing more than, well, just that. Aside from the potent and delicious C63 AMG models, there hasn’t been much to set the C-Class apart in the entry-level luxury/sport segment, leading to the model being regarded by many as “The Cheap Mercedes.” No, it’s certainly not a bad car, but for our money, it hasn’t stood up particularly well to competitors like the BMW 3 Series or Audi A4. So with the handsome new CLA-Class coming to round off the entry-level end for Mercedes-Benz, big plans are in store for the C-Class. We can see some evidence of that in this latest set of spy shots from our friends at CarPix. 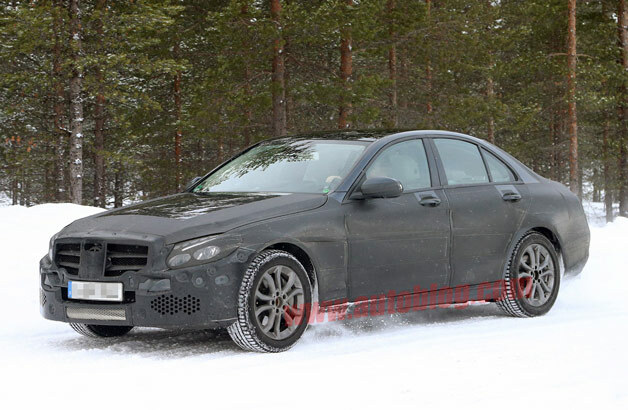 According to earlier reports, the new C-Class will be “far more dramatic” in the visuals department, and while the sedan’s sculpting is still covered by camo, the much sleeker headlamp design we see here is, at the very least, a good start. The car’s overall size is expected to grow a bit to further distance itself from the CLA, though thanks to lightweight materials, curb weight isn’t expected to increase. Just like the current model, the new C-Class is expected to use four- and six-cylinder engines, both gas- and diesel-fed, and overall power output for the global engine range should span from 120-ish on the low end to as much as 330. These new engines are expected to be mounted lower and farther rearward than before, offering better balance for both rear- and 4Matic all-wheel drive configurations. And as for that AMG? Rumors suggest a turbocharged 4.0-liter V8 will fall underhood. Expect the next C-Class to debut either later this year at the Frankfurt Motor Show, or more likely, at next March’s Geneva Motor Show. Vilken hÃ¤rlig start pÃ¥ dagen. Och jag gillar varkligen din halsduk!! En sÃ¥dan hade inte suttit fel att vira runt halsen 🙂 FÃ¥r man frÃ¥ga vart du hittat den?